No. 2400 Standing in the yard. Engineers' wagons and the end of the carriage shed in background. Crewe South steam shed. C1924. 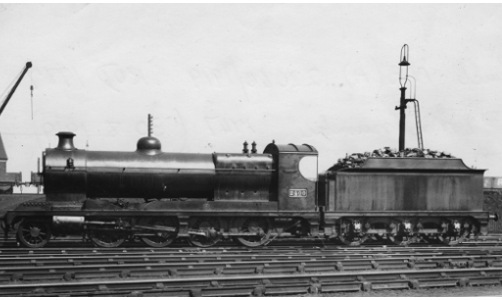 In common with many railways, after the First World War the LNW purchased thirty 2-8-0’s which had been ordered for use by the Railway Operating Division (ROD ) on the Western Front. Previously 151 had been hired from 1919-1921. They were classed ‘MM’s’ after the Ministry of Munitions which had ordered them but enginemen irreverently named them ‘Military Mary’s’. There was not thought to have been a specific Mary, simply a play on words, unless they were a Mary ‘quite contrary’. The design had originally come from the Great Central Railway (8K class) and had been chosen for mass production during the war for its power and ruggedness. With two 21in diameter outside cylinders, 153 sq.ft. grate area, 180 psi boiler pressure and eight 4ft 8in driving wheels it was a powerful engine for the time. Not such an effeminate Mary, then.